Creative sound artist and producer, spoken word and poetry specialist and linguist from Melbourne, Australia. Collaborating with poets and musicians on spoken word and music recordings, and with visual artists, film and theatre makers on installation works, sound design and poetry film. Lisa Greenaway has been working with poetry and spoken word, music and audio arts for over two decades as a sound artist, spoken word artist, producer and broadcaster. Trained as a specialist audio arts engineer at the Australian Broadcasting Corporation and with a background of creative radio production and theatre sound design, Lisa combines technical finesse with an intuitive ear for the rhythm and melody in everyday sounds, spatial awareness and the construction of atmosphere, weaving compelling stories with voice, music and field recordings. Lisa's work ranges from radio art works, spoken word and music tracks, and DJ sets to spatial sound installation works and poetry film, in collaboration with artists and writers in many fields both in Australia and globally. First experimenting with audio arts at Melbourne’s Triple R FM in 1992, Lisa created innovative poetry/soundscape productions and spoken word and radio drama programs for Triple R throughout the 1990s, including the long-running “Howlings in the Head” series and the weekly spoken word/ audio arts show “SubText”. As a spoken word artist Lisa collaborated with musicians and poets throughout the 1990s-2000's (including David Macken, Phil Wales, Richard Watts, Trevor Brown, Adam Simmons) and produced many live events featuring spoken word artists, songwriters, hip hop MCs, musicians, theatrical, visual and sound artists. Some notable events of this period: "Twilight" at La Mama, simulcast on Triple R FM; "Howlings in the Slaughterhouse" at Budinski's Theatre of Exile; "Tsunami" at Budinski's Theatre of Exile; "Word Jazz" at 303, Melbourne. At the Australian Broadcasting Corporation in Sydney from 1999-2001 she continued to experiment, working as an engineer on audio arts and radio drama, classical, rock/pop and opera recording, live talks radio and news, and TV drama. During this time Lisa also created sound, music and poetry productions and radio shows for 2FBi, 2SER, KGRIND, IndieFeed Performance Poetry, and Triple J, and co-edited special editions of "Going Down Swinging" and "Rattapallax" journals. Throughout the decades of 2000s and 2010s, as producer at the Noise Festival, then editor of international poetry, fiction and spoken word journal “Going Down Swinging,” and co-founder of the "Word Wrestling Federation" poetry slam series, Lisa contributed greatly to the development of spoken word as a recognised art form in Australia. Also during this time Lisa produced sound work for theatre and live performance including La Mama Theatre, Short & Sweet Sydney, Budinski’s Theatre of Exile, Next Wave Festival, Melbourne Writer's Festival, National Young Writers Festival / TINA, Noise, The Bridge Festival, and Celebrating Women Festival. Lisa’s two decades of work with spoken word and oral storytelling infuses her work with a distinctive, subtle narrative understanding. As a student of languages and linguistics (currently studying for Master of Applied Linguistics at University of Melbourne) Lisa’s ongoing research into the global phenomenon of oral storytelling – its origins and modern incarnations – informs all of her work. Complimentary research into philosophies of deep listening and sound meditation also informs Lisa’s soundscape creation and desire to develop truly immersive listening experiences. Recent installations include the Women of the World (WOW) festival's "Women, Art & Politics" residency, White Night Melbourne 2016 (IDEATION) and White Night Melbourne 2017 (The Night Garden and The Seadragon's Lair). In July, August and November 2018 Lisa was in residence working with the 4DSOUND system at the Spatial Sound Institute, Budapest, creating a one-hour installation working with storytellers of Hungary and Transylvania. From October 2018 to February 2019 the sound installation ||Reflections|| plays morning and evening in the MPavilion, Queen Victoria Gardens, Melbourne. World music / world spoken word DJ and broadcaster, mixing languages, stories and music from around the planet. 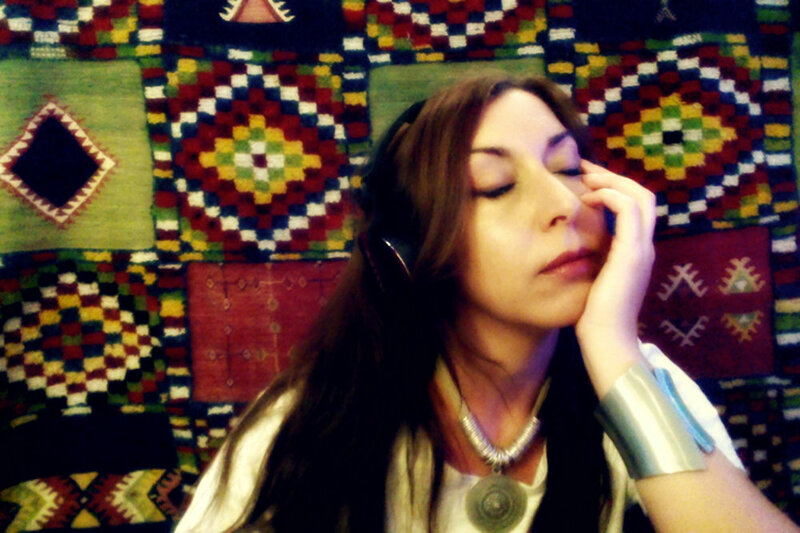 Presenter of "La Danza Poetica" radio show / podcast. As DJ LAPKAT, Lisa creates lyrical, kinetic mixes of global rhythm and melody, multilingual poetry and story. Spoken word artists, poets, storytellers, griots, hip hop emcees, cantati, chanteurs ... stories old and new, lost and found treasures, voices and languages from around the world mixed with music ranging from folk traditions to the cross-cultural collaborations of the global bass movement. Minimal beats made for slow dances, passionate voices and a stream of social consciousness. Incorporating her own field recordings and electronic music, LAPKAT sets are audio-cinematic, storytelling experiences, dancing to poetry. Collaborating with poets and storytellers, radio, labels, DJs and producers around the world, LAPKAT not only mixes up the existing, but is actively working to extend the reach of the recorded story and bring the essential spoken word art to a greater global audience. LAPKAT has collaborated with poets and filmmakers on spoken word / music / soundscape tracks and films – including Andrew Galan, Farkhonda Akbar Tufaan, Sukhjit Kaur Khalsa, Jutta Pryor – and has performed across Australia and in Paris, Athens, Berlin, Ibiza and Vienna. LAPKAT presents a monthly podcast, 'La Danza Poetica', broadcast on Radio Groovalizacion and Chimeres Greece, also presented on Mixcloud and podcast via iTunes, Stitcher, &tc. Featuring poetry, hip hop, folk traditions and global beats, La Danza Poetica is a deep exploration into the many worlds, one world poetic groove. In 2017, La Danza Poetica was nominated in the Best World Music category in the Mixcloud Online Radio Awards. LAPKAT live performances include: Horse Bazaar (Dialectic Sessions/Uber Lingua), Pure Pop Records, Señor BBQ, Ferdydurke, Overload Poetry Festival, Melbourne International Comedy Festival, Summer Renaissance Festival, Peats Ridge Festival, Melba Spiegeltent, Hares + Hyenas, Howler, Multicultural Arts Victoria's 'Emerge' Festival, Queensland Poetry Festival, Melbourne Festival, Au Chat Noir Paris, Berlin (Headful of Bees/Berlin Music Week), Groovalizacion/Warrior Poets/Elles Tournent/Dames Draaien festival Brussels, Kreuzberg Bar Athens, Chilli Rooms Ibiza, SSTR6 Vienna, support sets for Candy Royalle, Tanya Evanson, and the Rockin' for West Papua benefit. LAPKAT has produced special mixes and programs for Triple R FM and SBS Chill digital radio in Australia, Laid-Back Radio (LDBK) in Belgium, Latin Bass Mexico Records in Mexico, the 'c i r c e' project in Athens and the global female:pressure podcast. Releases include: "Nailing Remembrance" with Hazara poet Farkhonda Akbar, on Multicultural Arts Victoria compilation “Visible 10" 2015 and poetry film by Jutta Pryor; "Water for the Spirits" featuring the voices of the Women of the Great River project, Zimbabwe/Berlin, on “VOX”, 7MNS Records France, 2016; "Advance Australia Fair" with poet Sukhjit Kaur Khalsa, on “Reverb on Verse” compilation, 2016. INSTALLATION WORKS, RADIO, FILM AND PERFORMANCE SOUND.